Meghan Markle, the Duchess of Sussex, has collaborated with a group of female survivors of the deadly Grenfell Tower fire on a new cookbook. Meghan, 37, personally wrote the forward for the cookbook, "Together: Our Community Cookbook." In it, she describes the cookbook as a labor of love and something that brought the women together after last year's fire that killed 72 people. The authors of the cookbook gathered in the fire's aftermath at the Hubb Community Kitchen at the Al Manaar Muslim Cultural Heritage Centre in West London to prepare food for their families and neighbors. Hubb means love in Arabic. 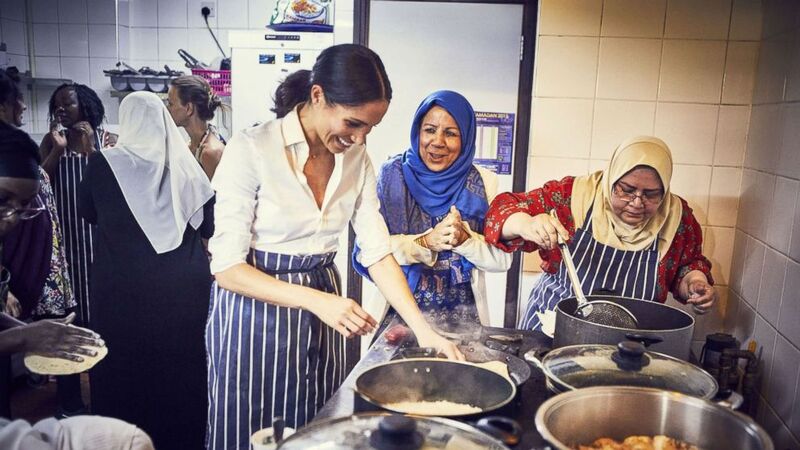 The survivors gathered to prepare food for their families and neighbors in the aftermath of the fire as a way of helping the community, “connect, heal and look forward and to convene through food,” according to a press release released by Kensington Palace. 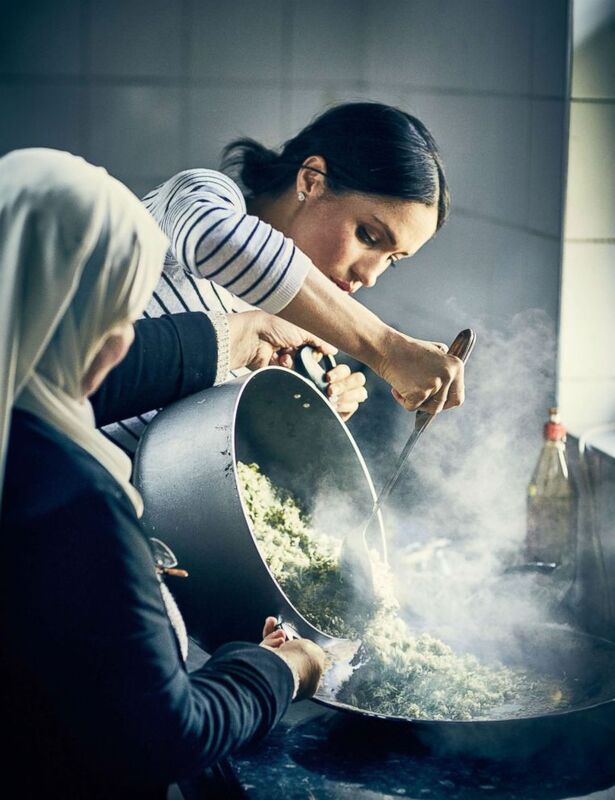 (Jenny Zarins via Getty Images) This undated handout image released by Kensington Palace on Sept. 17, 2018 shows, Meghan Markle, Duchess of Sussex cooking with women in the Hubb Community Kitchen at the Al Manaar Muslim Cultural Heritage Centre in West London, in the aftermath of the Grenfell Tower fire, which has resulted in the publications of Together: Our Community Cookbook. The Duchess of Sussex first visited the kitchen in January 2018 and has continued to make regular private visits. "I immediately felt connected to this community kitchen; it is a place for women to laugh, grieve, cry and cook together," Meghan wrote in the foreword. "Melding cultural identities under a shared roof, it creates a space to feel a sense of normalcy – in its simplest form, the universal need to connect, nurture, and commune through food, through crisis or joy – something we can all relate to," she wrote. "Through this charitable endeavour, the proceeds will allow the kitchen to thrive and keep the global spirit of community alive." Meghan also shared in the forward some of her favorite family traditions and how cooking has become a means of connection in her own life. The duchess shared that she longed for the days when she would return home to Los Angeles from Northwestern University to her mother's gumbo and, as a child, her grandmother's black-eyed peas, collard greens and cornbread. The cookbook has been a passion project for the Duchess of Sussex, who wed Prince Harry in May in front of celebrities including George and Amal Clooney, Oprah Winfrey and Serena Williams. Meghan wrote The Tig, a lifestyle blog about women, culture, travel and cooking, before her marriage to Prince Harry. She ended the blog before her engagement to Harry was announced last November. Her charitable and humanitarian endeavors prior to marrying Harry reflected the themes of women’s empowerment and gender equality. It appears with this cookbook, Meghan's first solo project since joining the royal family, she will carry on supporting women from all walks of society as she charts her charitable path. Meghan and Harry are due to embark on a two-week royal tour next month to Australia, New Zealand, Fiji and Tonga on behalf of Queen Elizabeth and the Foreign and Commonwealth Office. Harry, who turned 34 on Saturday, was recently named the Commonwealth Youth Ambassador by Queen Elizabeth. 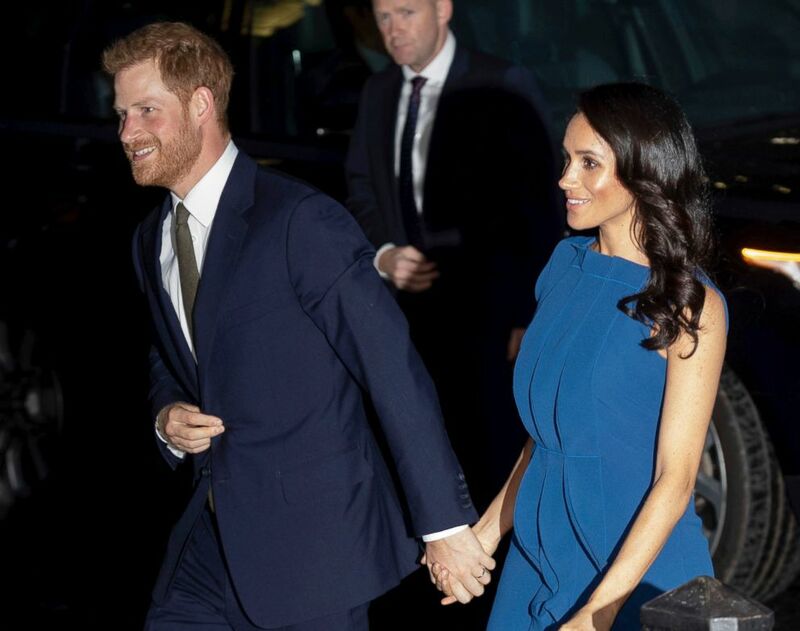 The couple is expected to spend a considerable amount of time appealing to issues important to young people while on their two-week tour, which will also include the Invictus Games. The Duke and Duchess of Sussex attended the 100 Days to Peace Charity concert. Harry and Meghan will attend the 2018 Invictus Games in Sydney. The tour is also expected to reflect some of Meghan’s humanitarian interests that she will likely take on as a new member of the royal family. The couple has had a busy few weeks since returning from summer vacation. The Duke and Duchess of Sussex were guests of honor at a gala concert last week to benefit veterans' mental health charities. They also recently attended the Well Child Awards to celebrate the bravery and courage of seriously ill children. The couple attended a benefit performance of the hot musical "Hamilton" in early September to raise funds for Sentebale, the charity Harry co-founded in 2006 to honor the work of his late mother, Princess Diana. Over the summer, they visited Prince Charles’s Castle of Mey in Scotland and also enjoyed an Italian getaway at the Lake Como home of George and Amal Clooney.